I’ve been fortunate enough to have been asked to do a few reviews for The Deli KC, and when Michelle Bacon asked me if I wouldn’t mind doing another one, I was happy to oblige. She offered me a choice: a band that I’m familiar with, or a band I’ve never heard of. 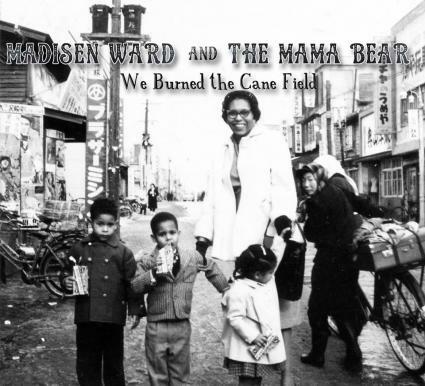 I decided that I wanted the challenge of reviewing music from an unknown source, so she assigned me the new EP by Madisen Ward and the Mama Bear, We Burned the Cane Field. I knew nothing about them, had never heard of them, and put the freshly-burned CD in the computer with no idea what I was about to listen to. We Burned the Cane Field is an ode to a simpler time, when musicians were in no hurry to tell their stories (no song on this five-track effort is less than four minutes in length), and did so without musical pretense (the instrumentation is primarily acoustic guitar and violin, with the occasional cameo appearance of a Dobro or cello). The result is twenty-five minutes of audio art that borrows from field hollers and country blues/folk sounds of an era long gone, descendants of the same lineage as the Carolina Chocolate Drops and Leon Redbone. There isn’t much info available on this newsome twosome so I asked Ward if he would fill me in on some of the history, and he was kind enough to share an exceptionally in-depth biography. I’ll let him share the entirety of it with you when he chooses, but to give you a little background: his mother (Mama Bear) started singing professionally in the early ‘70s and has recorded an album of her own. Ward began joining her onstage in his teen years, which inspired him to write his own music that he began singing at her shows. Eventually they decided to stop performing “her” music and “his” music and start focusing on “their” music. When they had enough material for an EP, they approached their good friend Joel Nanos of Element Recording, who was able to capture their sound just they way they wanted it to be captured. The title, We Burned the Cane Field, comes from a song that isn’t even on the record—just one of many qualities that make it a quirky and endearing effort. Once the music begins on the opening track, “Silent Movies,” you’ll understand why this recording instantly struck a chord with me. The underlying senses of family and togetherness are unmistakable, as you can almost envision Ward and his mother sitting on the porch on a late-afternoon summer day, singing to each other and whoever else may happen to be there. The joy of music for music’s sake is what motivates this duo, simple as that. They sing to each other in “Whole Lotta Problems,” with Ward playing the role of a man smitten with a woman and perhaps seeing her through rose-colored glasses, while his mother tries to talk some sense into him. The back-and-forth is a battle between his lovelorn lament and her maternal manner (“I bought her some flowers / she don't need your petal … a car that I gave her / it's just a piece of metal … I stole diamonds for her / she don't want a rebel”). Who ultimately wins? Does Mama Bear get through? Does Ward continue to hold dear his heart’s desire? Those are questions only the listener can answer. The lightheartedness of the opening two tracks give way to more depth and sobriety in the two that follow: “Darling Moon” showcases the voice of a world-weary and wizened soul that belies Ward’s 24 years, and Mama Bear’s harmonies add a mournful, empathetic tone. If you give yourself the chance to listen and truly pay attention to the lyrics and the melody, you’ll find the emotional weight of the song sneaking up on you. Truly a work of depth that, again, seems out of place given the youth of its lead singer. “Down in Mississippi” is the EP’s nearly-seven-minute opus that sounds as if it was born in post-Civil-War times. The sparse guitar/violin arrangement is sheer perfection, and though the words may paint a melancholy picture, the overall message is one of affection for a land that may not be perfect (“did you feel that heat today / the sores are on my feet today / the sour's not as sweet today”), but it’s theirs (“the cotton paints a field of white / you don't have to steal tonight / here you'll find a meal tonight”), and that’s alright. The closing track, “Yellow Taxi,” offers a hint of vaudeville by telling the story of a busker singing songs for change from passersby on a sleepy street corner. He doesn’t want much, and it won’t take much to get what he does want, so even though his life may have a few hardships and he isn’t living in the lap of luxury, it’s the life he chose—and there doesn’t seem to be much regret in his message. Madisen Ward and the Mama Bear, Ruth Ward, will be appearing next at The Great Day Cafe in downtown Overland Park on Saturday, August 10, 7 to 9 p.m. You can purchase their music on iTunes at the link here and also check out a video below from a previous performance at the cafe.